Vincent Price is a dashing man. Too dashing, in fact. It’s become a problem for my dark little soul. I’m having dreams of him officiating my wedding. That voice… it follows me everywhere. But in any case, House on Haunted Hill is another long-recommended classic movie for me. It’s a haunted house movie with a twist: The people at hand actually have a reason to stay in the house. Haunted or no, they’re going to go the distance. It’s not a matter of pride, or even for the sake of ghost investigation. They’re in this for cold hard cash. Supernaturals be damned. He’s rented out a haunted house and selected five people with some tie to it (or him) to come for a visit. One of them owns the house, and is continually creeped out in a very amusing way. But all five of these people need money. 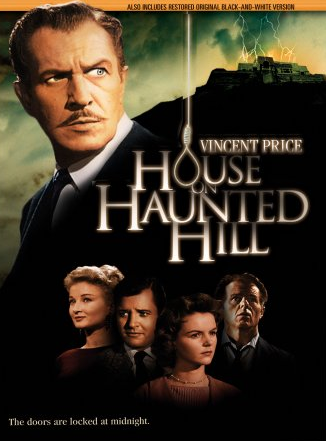 Vincent Price and his wife want amusement, and maybe to prove whether or not the house really is haunted. That last part isn’t fully clear, but you can’t imagine a better litmus test for a haunted location. The rules of the game go as follows: The doors of the mansion lock from the outside at midnight. Everyone has a gun to “protect” themselves. Whoever stays twelve hours in the haunted house earns $10,000. Once you’re in, you can’t escape. Let the creepiness commence. What I “learned”: A movie involving a good challenge will always be entertaining. Whether you’re competing to outlast others in a haunted house, hiding for your life in a foresty arena or narrowing down which goblet doesn’t contain poison, a good challenge never goes out of style. We like to see people compete, whatever it may be at. But an arena with rapid animals is not enough. We are too civilized for that in the 21st century. So instead, we subject our characters to crazy murder mystery dinners that keep all of us guessing too. We are so simple, we humans. See this movie if you like: Ghosts stories with little or any ghosts. This movie is best compared to And Then There Were None, a mystery story involving devious murder. There’s intrigue. There’s doubt placed on everyone. Even the two beautiful young people hook up for no tangible reason. It’ll tickle your brain if you’re one for frights. Avoid this movie if: You don’t much stand for campy horror movies. This movie definitely has some cheesy moments, and an inexplicable vat of acid down in the basement. It’s still bubbling, by the way. Also, a skeleton flies through the air on a few occasions. Be prepared for that nonsense.